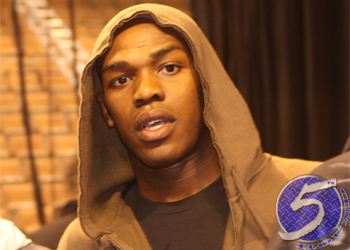 ‘Jon Jones (Pictured) is a selfish, two-faced phony.’ That’s just one of the many insults the reigning light heavyweight king has heard since UFC president Dana White fingered him for UFC 151’s cancellation. However, fans’ disdain for Jones seemed to spread well before last month’s debacle. For whatever reason, “Bones” has continued to rub people the wrong way. Whether they believe his interviews come across as cocky, his tweets are of the self-righteous variety or his breaths are simply too loud, Jones can’t win in the court of public opinion. Pleading guilty to DWI after wrapping his $190,000 Bentley around a telephone pole certainly didn’t help his brand. Nonetheless, he’s arguably the most unstoppable force going in mixed martial arts. If the organization has ever employed a fighter who can cross over into the mainstream, it’s Jones. Love him or hate him, Jones is who he is and willingly admits he’s a work in progress. “I don’t think people realize that five years ago, I was just an average kid,” Jones said during Tuesday’s conference call. “I went to high school, grew up poor. Went to college, dropped out. I’m a normal dude, and I’m a 25-year-old. I’m gonna make lots of mistakes. I never got officially trained for PR. I’m a snotty-nosed dude. I say what I feel and some people totally dig me and understand what I say, other people think I’m the most arrogant whatever person in the world. Jones wasn’t the sole purpose UFC 151 was nixed, despite how badly White tried to blame his golden boy. The card’s overall lack of star power, Dan Henderson’s two-week silence regarding his torn MCL, etc. all factored into the show’s elimination. On the flipside, plenty of things Jones said/and or posted on Twitter didn’t help his image. At a time when he should have laid low, Jones said White should look in the mirror if he wanted to blame someone for UFC 151’s demise, and tweeted it wasn’t his fault the “old man” wasn’t prepared to fight September 1st. As far as Jones is concerned, that’s just him being him, and everyone is going to have to take the good with the bad – even if many believe there has been an overabundance of the latter of late. “Everyone keeps saying, ‘You should hire a PR guy.’ At first they said I was too fake, now they want me to hire a PR guy to give them something watered down and fake?” a confused Jones asked. “Listen to the things that I say, some people find legitimacy and some people think I’m full of it. “I’m not a bad person. If you talk to me about fighting, you may just hear something that’s a little arrogant because, right now, I train so hard to not get hit, let alone talk about losing a fight. I love this sport so much, I owe it to myself to think of myself in the highest regard. So I’m not gonna apologize if I’m a little full of myself when it comes to MMA. You’ve got to be full of yourself, that’s the way you master yourself. Jones defends his throne against Vitor Belfort at UFC 152. A devastating finish can quickly erase a lot of the negativity surrounding the budding superstar. The question is, will he say, do or think something after the fight to irritate people?